This review is devoted to analysis of the scientific data concerning polycarbosilanes and some of their functional derivatives, primarily, published in the last ten years. The scope is limited to highly molecular weight products of the above-mentioned type, prepared via polymerization of cyclic monomers as the most effective and flexible synthetic approach. The chapter consists of two main parts: heterochain and carbochain polycarbosilanes. It includes description of ring-opening polymerization (ROP) via rupture of endocyclic Si–C bonds in strained silacarbocycles, ring-opening metathesis polymerization (ROMP) via rupture of endocyclic C = C bond in silylcycloolefins, and vinyl type addition polymerization (AP) of silylnorbornenes. 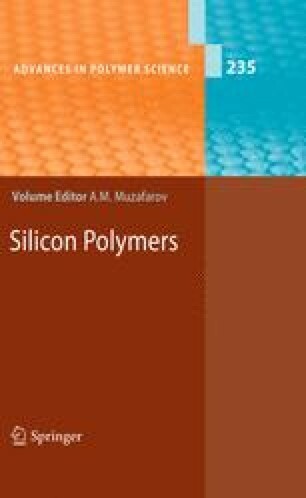 The review pays much attention to structure and physical chemical properties of the obtained polymers as well as possible ways for their applications. The mechanisms of some polymerization processes are also discussed. This work was supported by The Russian Foundation of Basic Research (Project 09–03–00342-a).